Blueberries are a vibrant and tiny blue fruit packed with nutrition. They are especially high in antioxidants, and are known to do everything from boost brain health to promote heart health and even fight cancer. But you may wonder, how long do blueberries last? Do you want to know how to tell if blueberries are bad? It depends on storage conditions, the ripeness of the berries when picked or purchased, and how storing blueberries impacts their longevity. Unfortunately for blueberries, improper storage can lead them to become mushy and moldy. Several varieties of blueberries are grown throughout the world, and you’ll often find them fresh at farmer’s markets from the middle of spring until the end of the summer. You also won’t have any trouble finding fresh blueberries in the produce section of any grocery store. Regular and wild blueberries are available in the frozen fruit section as well. When it comes to blueberries, organic is better because the conventional varieties often contain harmful pesticides. Blueberries can be added to any recipe for sweetness. Eat them alone, add them to your smoothie or salad, or use them for baking. This article will show you how to store blueberries properly. Also, learn what happens if you eat a moldy blueberry, as well some storage tips to make them last longer. This section will provide extensive information on how to store blueberries in the freezer and refrigerator. We will also detail how to improve the shelf life of blueberries in room temperature conditions, and when drying them. How long do fresh blueberries last at room temperature? You should only leave blueberries at room temperature if you plan to consume them on the same day. At the most, fresh blueberries last two to three days on your counter. This is because blueberries are highly perishable. They also do not ripen after being picked. Similar to other fresh fruits, blueberries often do not have a “best before” or “use by” date; therefore, you will need to use the date you purchase them as a guideline. Sometimes, when purchasing packaged blueberries, you will find a label containing the date on which they were picked. How long do blueberries last in the fridge? When stored properly, blueberries will often keep for five to 10 days, or about one to two weeks, in the refrigerator. You can refrigerate blueberries in their plastic clamshell container, or you can place them in a shallow container and cover with plastic wrap. To improve refrigerator shelf life, sort the blueberries to remove stems, leaves, and other debris. Also, remove broken, soft, and moldy blueberries. The following are steps to consider when you refrigerate blueberries. Use a well-washed container: Rather than using the original plastic basket your blueberries came in, you can alternatively use a ceramic bowl or basket-like container with slits or small holes that provide adequate ventilation. Avoid containers with metal since the blueberries can react with metal and lead to stains and discolorations on the blueberries. How to store: Place a paper towel at the bottom of container. The paper towel will help prevent mold while soaking up moisture. Place unwashed blueberries in the container. You will wash the blueberries before eating or cooking them. When storing in the refrigerator: Avoid putting blueberries in the coldest part of the fridge, or else they will get damaged. Also avoid keeping blueberries in the crisper, since most crispers do not provide enough circulation and are too humid. The top of the fridge is the coldest section, so the best part to store the blueberries is at the middle or bottom shelf. How long do blueberries last in the freezer? Blueberries can also be placed in the freezer and saved for later. But, how long do frozen blueberries last? They will last six months to a year in your freezer. Frozen blueberries can be used for smoothies, breads, pancakes, or waffles. Frozen blueberries do not need to be thawed before using them. That being said, rinsing the blueberries with cool water may prevent them from releasing too many juices when you bake with them. You can purchase frozen blueberries, or you can learn how to freeze your own fresh berries. Want to know how to freeze blueberries? The following are steps to help you freeze your blueberries. Spread blueberries onto a shallow, single-layer tray: First, sort your blueberries and remove the leaves, stems, other debris, or moldy or damaged berries. Blueberries should be frozen individually first to prevent them from clumping or sticking together. If using a metal tray, line it with parchment paper to protect the berries. Place tray in freezer: Once in the freezer, it will take two to three hours until the blueberries are completely frozen. Transfer blueberries to proper storage container: After you remove the tray from the freezer, you will be transferring the blueberries to a freezer-safe “Ziploc” or resealable bag, before placing them back into the freezer. You can also choose to preserve your blueberries by drying them in a dehydrator or oven. Dried blueberries are useful as snacks, in homemade granola, or for topping on your salad. Dried blueberries can be stored in a clean plastic bag or jar in a cool, dark area, and away from heat. Dried blueberries will last up to a year. You can also store dried blueberries in the freezer. Want to know how to dry your blueberries in the oven? The following are steps to help you dry your blueberries. In a medium pot with a vegetable steamer insert, add enough water to fill the steamer basket about halfway. Bring the water to a boil. Add the blueberries, and boil the water for 30 to 60 seconds. Remove the steamer basket from the boiling water and place it under a stream of cold water. This will cool the berries and prevent them from further cooking. This process is needed to promote air penetration and crack the blueberries’ outer skin. Place the blueberries on paper towels and let them try for 10 to 20 minutes. Transfer the blueberries to multiple baking sheets. The trays will form a single layer in the oven. Use one to two pounds of blueberries per tray. Adjust your oven racks so there is a one-inch space between each tray. Preheat the oven to 140 degrees Fahrenheit. Place the blueberries in the oven and leave the oven door ajar. A gas oven door should be open one to two inches; for an electric oven, leave it open four to six inches. Dry the blueberries in the oven for about four hours, and rotate the baking sheet and gently stir the berries with a spatula every 30 minutes. Transfer the baking sheets to cooling racks. Once at room temperature, store the blueberries in airtight containers. Table: How Long Do Blueberries Last? The following is a quick and easy table to refer to when you want to know how long blueberries last. Do you want to know how to make your blueberries last longer? The following storage tips will help you get the most out of your blueberries. When you purchase your blueberries, look through them to make sure there are no moldy ones hidden inside. Throw out the ones with white, fuzzy mold that can be found around the stem. Mold can spread between berries when they are in close contact with one another. Even when you know how to store blueberries properly, hidden mold can wreck the whole batch. Most of the blueberry stems have likely fallen off on their own. However, it is a good idea to go through the blueberries and remove any remaining stems. There is no harm if you eat them other than the berries being bitter. Only rinse your blueberries if you plan on eating them. Washing them will otherwise encourage mold growth. If you are going to rinse them before eating, you will reduce the chance of mold growth if you make sure you dry them. If you have rinsed your blueberries, place them on a paper towel-lined tray to dry. Roll the berries around until there is no visible water on them. At this time, transfer the berries to a breathable, paper towel-lined container. The paper towel will absorb excess moisture, while the air circulation will discourage mold. As mentioned, you generally will not wash your blueberries until you’re ready to consume them. However, washing them with vinegar water can kill and prevent mold spores. You can place the blueberries in a strainer, and submerge them in a bowl of vinegar water. Shake the strainer and pull it out. Wash the berries with cool water to remove any vinegar flavor. If your blueberries are overripe, it is a good idea to place them on a baking sheet and have them freeze in the freezer for a couple of hours before transferring the berries to resealable bag. You will want to avoid storing blueberries in refrigerator crisper drawers unless you can adjust for lower humidity. Blueberries like to breathe, so it is best not to pack crisper drawers too tight since that will decrease airflow. Want to know how to tell if the blueberries are bad? Blueberries are subject to becoming overripe or rotting easily due to warm weather. It is important to identify whether your blueberry has gone bad. The following are a few things to consider if you think your fresh or frozen blueberries are no longer good. General appearance: If you find that your fresh blueberries are soft, mushy, wilted, or shriveled, this means the blueberry is likely on the brink of going bad. Discard blueberries that have mold or an unpleasant smell or appearance. Color: Blueberries are purplish-blue in color with a bit of red. When blueberries are deep purple or dark red, they should be thrown away. Skin: Blueberries have very delicate skin; as such, you should check them for any cracking or leakage. When the blueberries are cracked and leaking fluid, they are overripe and therefore should be discarded. Bruised or cut blueberries also allow the entry of bacteria, which can lead them to spoil as well. Touch: If you touch a blueberry and it is not firm, it is overripe. Also, shriveled blueberries are rotten. Your blueberries should be plump and firm. Frozen spoilage: How do you know if your frozen blueberries are no longer good? If discolorations or dry spots have developed on frozen blueberries, this means freezer burn has begun to develop. This will not make the frozen blueberries unsafe to eat; however, it will affect the taste and texture. What Happens If You Eat Bad, Moldy Blueberries? Most people likely do not intentionally eat moldy produce, but it can sometimes happen without you realizing it. What happens if you do eat a moldy blueberry? When you accidentally eat a moldy blueberry, most of the time, nothing will happen. The white mold on blueberries is likely a type of trichoderma, which is not often dangerous to humans. That being said, these blueberries don’t taste good, and are often limited in nutrients. Some people are more sensitive to this type of mold and may experience an allergic reaction in the form of swelling, itching, difficulty breathing, or gastrointestinal upset. Potentially problematic digestive symptoms may include nausea, vomiting, cramping, watery stools, and diarrhea. E. coli (Escherichia coli), shigella, and salmonella are bacteria commonly associated with contaminated blueberries, and can also lead to digestive problems. To be on the safe side, it is best to eat fresh berries when you get them to prevent them from becoming moldy or bad. If you notice they are moldy as soon as you get home, be sure to take them back to the store. Blueberries are a delicious fruit with plenty of health benefits. However, you definitely want to get the most out of your blueberries. In this article, we answered the question, “How long do blueberries last?” We also looked at the shelf life of blueberries, whether they are fresh, frozen, dried, or kept at room temperature. Furthermore, we looked at how to tell if blueberries are bad or moldy. The general appearance, skin, color, and texture are important factors in determining whether a blueberry is bad. In general, moldy blueberries will not likely do harm, but you will still want to throw them away. Overall, blueberries are a great part of a healthy diet and lifestyle, and having one to two servings of blueberries daily can add major benefits to your health. 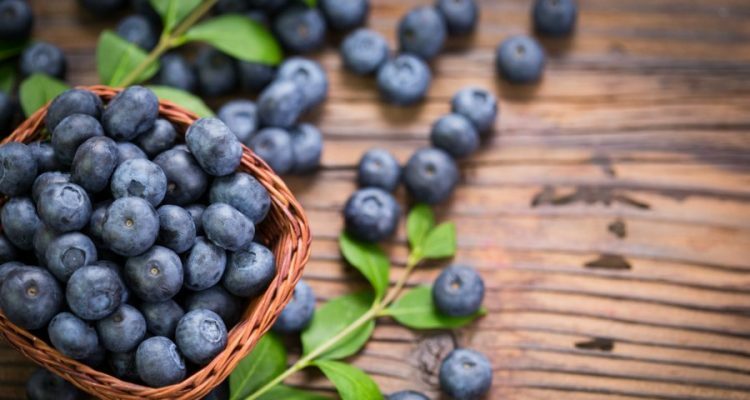 Link, R., “Top 7 Health Benefits of Blueberries,” Dr. Axe; https://draxe.com/health-benefits-blueberries/, last accessed March 9, 2018. “How to Store Blueberries,” wikiHow; https://www.wikihow.com/Store-Blueberries, last accessed March 9, 2018. “Tip on Storing Blueberries to Enjoy All Year!” North Carolina Blueberries; http://northcarolinablueberries.com/storing-blueberries-north-carolina-blueberry-council-inc/, last accessed March 9, 2018. Sterns, A., “How to Store Blueberries to Keep Them Fresh,” Spoon University, July 4, 2017; https://spoonuniversity.com/how-to/how-to-store-blueberries-to-keep-them-fresh, last accessed March 9, 2018. Lohrey, J., “How to Dry or Preserve Blueberries,” Livestrong, Oct. 3, 2017; https://www.livestrong.com/article/508752-how-to-dry-or-preserve-blueberries/, last accessed March 9, 2018. Hughes, B., “How to Store Blueberries the Right Way,” Epicurious, June 8, 2017; https://www.epicurious.com/expert-advice/how-to-store-blueberries-article, last accessed March 9, 2018. Thomson, J.R., “This Is What Eating Moldy Fruit Does To Your Body,” HuffPost, June 15, 2017; https://www.huffingtonpost.in/entry/moldy-fruit-okay-to-eat_us_59402f8ee4b003d5948b6f72, last accessed March 9, 2018. “Tips To Identify Rotten Blueberry,” iFood.TV, Nov. 29, 2011; https://ifood.tv/shopping/402794-tips-to-identify-rotten-blueberry, last accessed March 9, 2018. “Health Effects of Eating Rotten Blueberry,” Fawesome.TV, May 7, 2012; https://fawesome.tv/health/422534-health-effects-of-eating-rotten-blueberry, last accessed March 9, 2018. “Avoid mold on blueberries,” The Spectrum, May 25, 2015; https://www.thespectrum.com/story/life/features/mesquite/2015/05/25/avoid-mold-blueberries/27919143/, last accessed March 9, 2018.